Here's a drugstore buy of the week that was a big surprise for me! 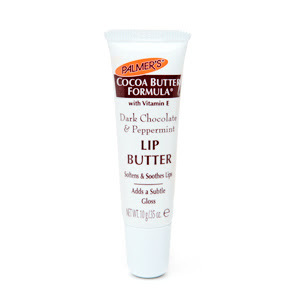 I generally think of Palmer's Cocoa Butter products as great buys for body care, but they have recently expanded the line to include, among other items, two yummy, chocolate based lip butters. Palmer's Cocoa Butter Formula Lip Butter, Dark Chocolate & Peppermint actually smells like a chocolate peppermint patty! However, it's not overly strong or sweet smelling, and the hydration is amazing. It makes a fantastic lip balm to apply overnight, when lips are chapped or underneath a more matte lip color product. Thanks for posting this! I'm trying to find information on Foreign Pharmacy,drugstore.it will definitely helped me in this process.